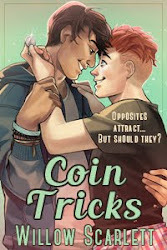 My new novel Coin Tricks is available now! Wire's too huge and intimidating to find love… but that doesn't stop him dreaming. His size has defined his whole life, from his jobs as a bouncer and store security to his brief and unsatisfying relationships. But beneath his scary appearance, Wire's kind and loving. He cares for his family and his dog and imagines a future with a goat at his side. Then he catches Sid stealing soap. Sid's a cute librarian and aspiring magician, raising his sister alone and stealing when he can't make ends meet. Wire should report the theft to the cops, but instead he takes food parcels to Sid, and an unlikely friendship forms. Sid is shy and scared at first, but with time he reveals his inner strength and the burning ambition that makes him the opposite of Wire's laid-back aimlessness. Wire falls hard but can't bring himself to do anything about it. He's never been anything more than disposable to goats, and he can't bear to have his heart broken by his only friend. And years of trying to be different can't hide the fact that Wire was raised to be rough, to think with his fists and ask questions later. He keeps making a bad impression on Sid without meaning to, running the risk of losing Sid before they even have the chance of finding something more together. 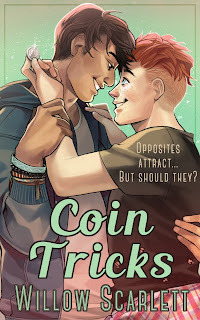 Coin Tricks is a standalone M/M romance novel with a HEA and no cliffhangers. This is a very exciting day for me because I've been editing this novel since early 2014 and I am so glad that I get to share it with everyone! The cover is illustrated by the incredibly talented Kazi. I just finished reading this book, and I just wanted to tell you I absolutely loved it. 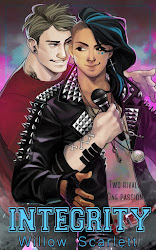 Everything about it was so beautiful: the characters, Sid and Wire's growing relationship, Wire's large and loud family and the setting (I wanna go visit New Zealand now!!). And your writing and the way you use words...that was most beautiful of it all. Reading this book filled my entire being with joy, laughter, sadness and tears (both happy and sad). But above all it filled me with beauty.